Stargazers were treated to an amazing show as the moon passed between the Earth and the Sun Thursday, creating a “ring of fire” that is visible across most of eastern and southern Africa. The best vantage point was is Tanzania and Reunion Island. 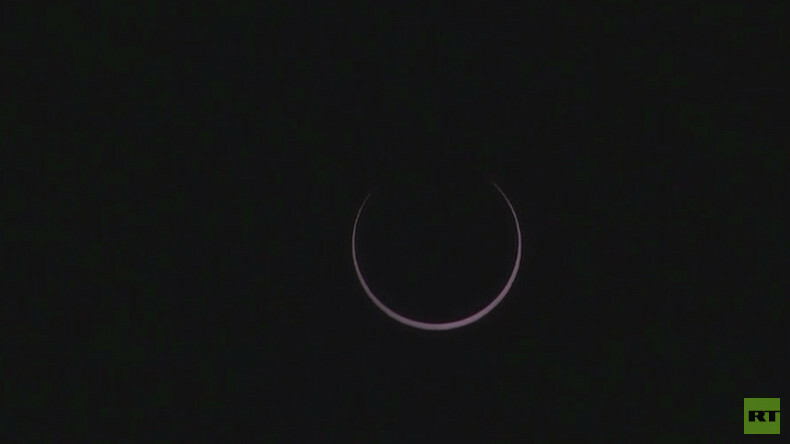 The longest eclipse was visible in Tanzania, peaking at 12:06 p.m. local time and plummeting the sunny day into partial darkness. Spreading across a 60-mile (100km) radius, those outside the full eclipse were able to enjoy a still impressive partial eclipse. Also known as an annular eclipse, the ‘ring of fire’ is a rare treat, with only three more to occur this decade. Unlike a total eclipse, the moon is smaller than the sun when it passes by it, producing a ring effect. Those lucky enough to witness an annular eclipse hopefully remembered that even with massive reduction of light, it is still unsafe to look directly at the sun and was better viewed through a filter, pinhole, or the safety of RT's live stream.